This week I've been having fun with customer cohorts and dashboard actions. Create a chart to show the number of customers who first purchased from us in each year. Create a chart to show the number of customers who last purchased from us in each year. If the Customer purchased from us in the last year in the data we have available we should assume they are still a customer of ours. 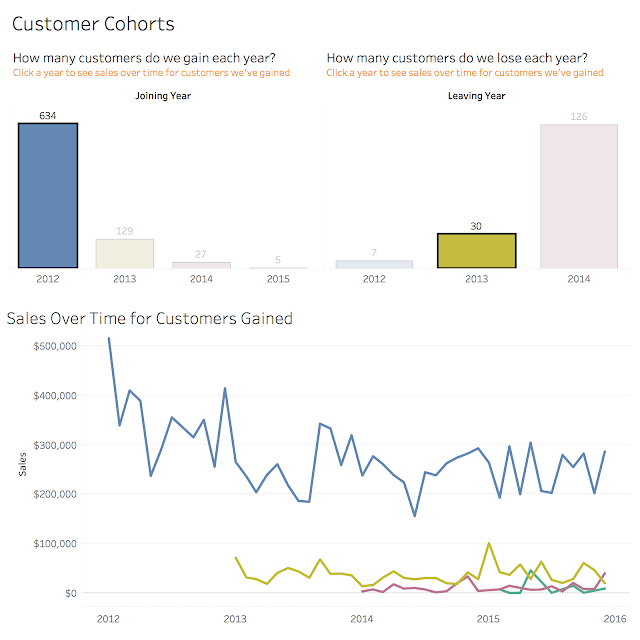 Create a chart that shows sales over time for customers joined or left, depending on what bar chart you click on. Make sure you test your actions thoroughly to ensure that nothing conflicts. Make sure you match my titles, tooltips etc. I'm using the Superstore Sales data. Remember when you're done to tweet a picture and link to your finished dashboard to @EmmaWhyte and @VizWizBI with the #WorkoutWednesday. Hi Emma, do you post your method somewhere? I had trouble creating the filters and exclusions properly for the Sales chart.